Just in case anyone might want to run up to the Arena Stage in Washington to see The Velocity of Autumn, I want to talk briefly about it. It has only four more days to go, closing next Sunday. Being diehard fans of the Arena, Joan and I saw it on Sep. 21. It’s been highly touted as the kick-off for Arena’s new season. Directed by Artistic Director Molly Smith herself, the two-person cast includes the ever feisty Estelle Parsons, of Bonnie and Clyde fame. (She’s now 85, and I’m sure she must hate that reference, given all the other wonderful work she has done on stage and screen.) Joining her is Stephen Spinella, who won Tonies for his work as Prior Walter in Angels in America. This play was apparently originally intended to open on Broadway, but with no theatre available for it, Arena picked up the slack. However, they’re still billing it as “An exclusive pre-Broadway engagement.” So if anyone really wants to find it, look for it next in New York. Great idea for a play, no question: What to do with an aging parent? It’s something we’ve all faced, or may well face, sooner than we’d like. Personally, Joan and I are now of an age when our kids may soon have to figure out what to do with us, and we’re already busy thinking “Not if I can help it you won’t! So the premise: 79-year-old Alexandra has barricaded herself in her Brooklyn apartment, behind locked doors and surrounded by Molotov cocktails should anyone attempt entry. Her children call for her to come out, presumably to enter a lunatic asylum, or at the very least an old folks home. She will have none of it, threatening to burn the whole block down. The threat seems real enough to involve the police. So is she completely insane, or merely asserting her rights to live her own life? To help us resolve the question, in through a window, conveniently unlocked despite the barricade, crawls Chris, an aging pony-tailed hippie and the only one of her children with whom she could ever relate. Gay, occasionally suicidal, and as independent-minded as his mother, he had long-ago escaped the family to lead his own life, and has returned only to rescue his mother. But can he, before the police intervene and the rest of the family has its way? What a great set-up! What follows is a series of tactical games and revelations. But for my taste, there was too little of the latter, and entirely too much of the former. 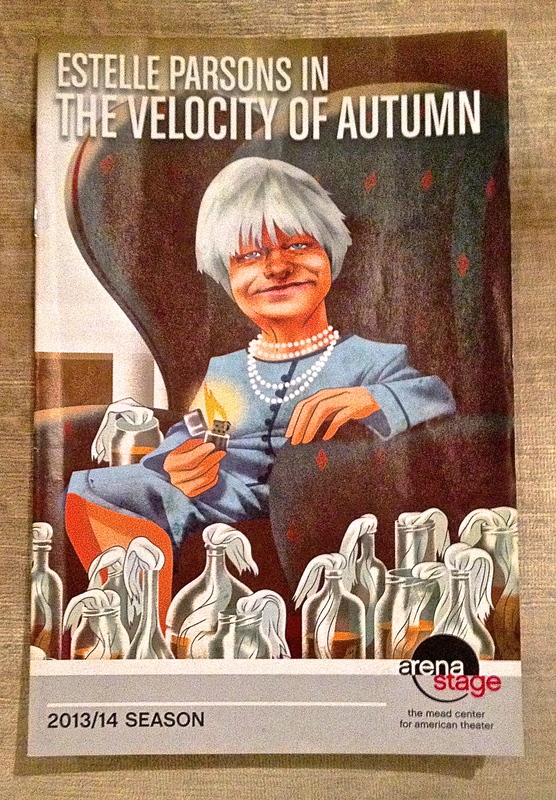 As a whole, The Velocity of Autumn plays very well, and we enjoyed both the play and the production. But we wanted it to go deeper, and I suspect the playwright did too. The sitcom-like one-liners might have been necessary to generate the laughter to create the reviews to generate the audiences to put butts in seats. But they also seemed to detract from the sweeter, more poignant moments, leaving us to make assumptions that we didn’t have to work very hard to seek out any more valuable lessons than a quick giggle. The play is good. But it employs far too many TV sitcom conventions, and it ought to be way better than it is. I suspect it has already grown a lot at the Arena, under Molly’s guidance. And by the time it moves on to New York, if it does, perhaps it will have grown even better. Think of that: Washington returns to the good old days, when, like Boston, Chicago, Phillie, and New Haven, it used to be a major out-of-town tryout city. This entry was posted in Theatre and tagged Angels in America, Arena Stage, Eric Coble, Estelle Parsons, Molly Smith, Stephen Spinella. Bookmark the permalink.